Teaching tennis to children with Autism Spectrum Disorders has been one of the most rewarding experiences of my life. I myself started playing tennis at the age of 5, having no idea that the sport would eventually take me around the world, meeting amazing individuals along the way and teaching me many invaluable life lessons. One of those life lessons is about the importance of giving. I am thankful for the gift of tennis and it is incredibly fulfilling for me to watch children with Autism and special needs play the sport for the first time. Tennis is a wonderful sport for children with autism. It improves fitness skills and physical health as well as the development of motor skills (ie-gross motor, fine motor). Tennis activities including running, jumping, hand-eye coordination drills and basic tennis strokes provide children with repetitive learning opportunities which transfer into daily living skills. Over time, educators and family members notice a decrease in stereotypical behaviors such as hand flapping or rocking as a child increasingly engages in structured sports, such as tennis. With participation, the children experience an increase in overall physical and mental well-being. Being a Speech-Language Pathologist in the field of autism for 14 years, I teach language skills to children in the classroom. 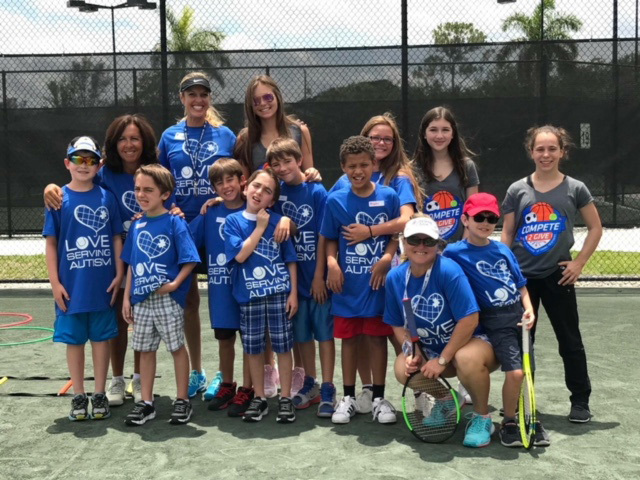 Now, as the Founder of the nonprofit tennis organization Love Serving Autism, I can also teach language and social skills to children on the tennis court. It is necessary to provide opportunities for the children to initiate, request, comment and protest during classroom and sporting activities. This enables their language skills to grow and generalize into different environments. If a child is nonverbal, we provide access to communication technology and picture exchange communication systems so the child can express himself/herself on the tennis court. Children with Autism Spectrum Disorders prefer predictability and consistent routines. Love Serving Autism provides each child with a tennis social story. This story helps to teach the child about routines, expectations and behavioral standards during tennis class. Volunteers are an integral component for our tennis organization. These volunteers provide necessary modeling and social engagement for the students with Autism Spectrum Disorders. This greatly motivates the tennis program participants to build positive relationships with both peers and neuro-typical individuals. Meanwhile, the volunteers also gain an invaluable experience because it increases their knowledge and awareness of children with special needs which greatly benefits our community’s overall well-being.